This tutorial covers building Gravity Forms able to receive user-generated content via Uploadcare. In case you are running a WordPress powered website, you might also want to check out our WP integration tutorial. Integrating with Uploadcare also ensures you need no storage for user media. Every uploaded media is delivered via our smart CDN providing improved load times for your system and saving bandwidth. Gravity Forms can be highly customized. One of the ways to do that is by using “filters.” WordPress defines filters as special functions allowing plugins to modify various types of internal data. 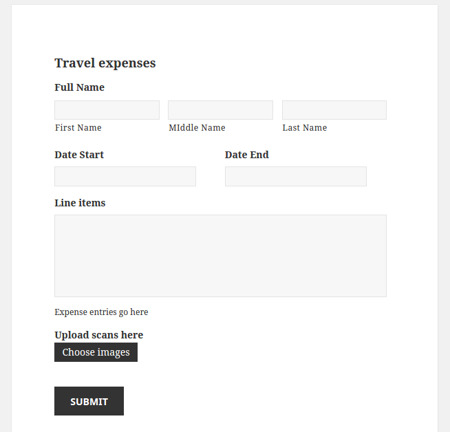 Let’s build an example form for submitting travel expenses. Use the code below to add a field. Put it in functions.php. The file is usually located under your WordPress theme directory, e.g., /var/www/wordpress/wp-content/themes/twentyfifteen/functions.php. Use the code below to inject settings attributes into widget fields. Feel free to use multiple settings if needed. This allows you to control widget labels, descriptions, layouts, and validation settings via the Gravity Forms admin interface. We’ve just changed our field lable to “Receipts”. That is to hint users at the type of content to upload. $input can be modified to hold any number of local widget options. The data-images-only option sits in the widget config to provide a fail-safe experience when working with accounts on the Free plan with no billing info added: those only allow image uploads. In the example above, data-images-only is used to allow image file uploads only, and data-multiple to let users send many files in one go. 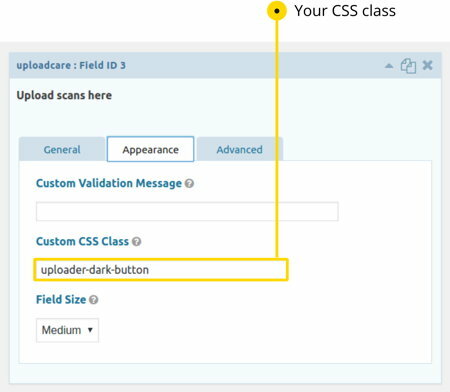 Next, locate your Gravity Toolbox, switch to “Advanced Fields,” and click “Uploadcare” as shown in the picture. 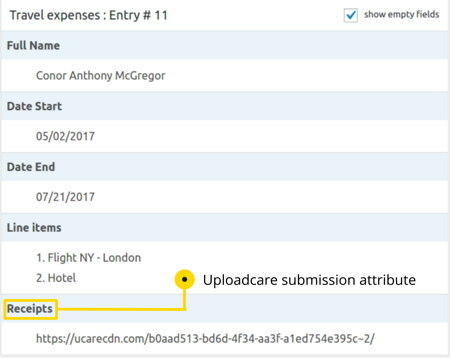 You should now be able to see the Uploadcare button in your Gravity Forms toolbox. The guide does not cover adding simple date and text fields to the form: those are intuitive. This step is optional and covers changing the widget’s button caption and styling. For instance, you want a black button. Put the file in your base directory, e.g. wp-content/plugins/gravityforms/css/uploadcare-style.css. Next, inject the stylesheet into your page. Gravity Forms renders custom scripts through gform_enqueue_scripts. So, the next step is about adding the snippet provided below to functions.php. Please, refer to Steps 2-4 for details. Gravity Forms is able to pick up and apply styles to your widget automatically. For more ideas on styles, you can check out the widget docs. 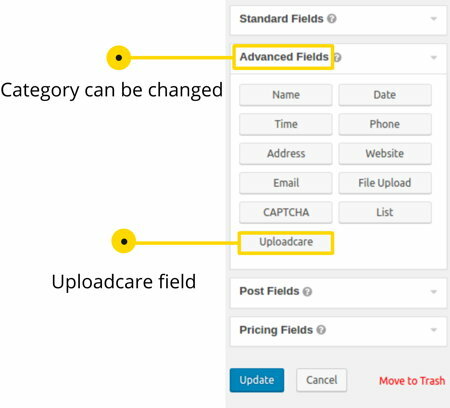 We have just allowed users to add media to a form by integrating Uploadcare Widget into Gravity Forms. It took four simple steps and will just work.